These days, four valves per cylinder engines are the norm – everything from the humble 2-litre to the largest V8 seems to run four valve designs. However, there is still a multitude of older two valve designs being modified for performance applications, and of course some current engines – especially US-sourced V8s – retain a two valve format. One way in which the performance of a two valve engine can be upgraded is by the use of a split intake manifold, where instead of each intake valve having a single flow path to it, two paths are used, with one able to be blocked by a butterfly valve. It’s the cheapskate approach to two intake valve design, if you like. In the mid-Nineties, Ford took this approach with a number of engines – the 2-litre CVH 14 four-cylinder and the 3.8 and 4.2-litre Essex V6s – and the split-port approach continues in some Ford models to this day. In this story we’ll take a look at the way in which the company carried out the development of the split-port concept and the advantages that resulted from it. It’s food for thought if you’re developing a new intake manifold or trying to get the utmost out of an older engine design. The requirements of an engine to be able to breathe large amounts of gases at high loads, but also achieve good cylinder filling and combustion properties at low loads, often result in design conflicts. For example, the high load abilities are enhanced by the use of free-flowing, low restriction intake ports with large intake valves. However, at low loads this combination will result in low velocity flows which negatively affect burn rates and combustion stability, in turn requiring a means of generating turbulence as the charge enters the combustion camber. And turbulence-engendering features will often negatively affect high load performance! 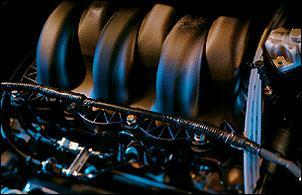 One approach that helps overcome these problems is to vary with load the flow characteristics of the intake system. For example, the pictured Nissan Induction Control System (NICS) was used on the RB20DET 4-valves per cylinder engine to block one of the two inlet valves per cylinder during low load operation, in turn increasing the flow velocity through the remaining open inlet valve. Toyota and Mazda have used similar systems, while in some VTEC iterations Honda deactivates one of the intake valves at low loads, so improving velocity and swirl. Less common are variable systems used on single intake valve engines, however Fiat, Mazda and Toyota have used systems of this type on some of their engines. 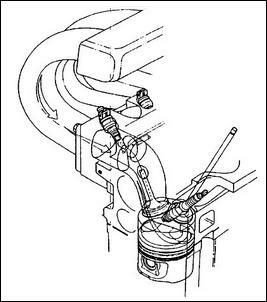 Ford’s Split Port Induction (SPI) system used a new head which incorporated two intake passages leading to each intake valve. A butterfly valve was placed inside one of the intake passages; the valve could be either open or shut. In its shut position, all intake air was directed down the other passage, which used an angled design to create swirl within the combustion chamber. When the secondary deactivation valve was open, maximum volumetric efficiency was achieved, with the intake air able to flow down both passages. The injector was located in the always-open primary passage. Extensive testing was carried out on the flowbench, both in measuring airflow and also looking at in-cylinder swirl (measured using a rotating vane). In this testing, the deactivation valve was varied in its position in 10 degree increments. On the four cylinder CVH head, a clear relationship between airflow and valve position was gained, becoming very apparent as valve lift exceeded 4mm. For example, with the deactivation valve shut, at 10mm valve lift the peak flow was about 20 litres/second (at 10 inches of water pressure differential), while with it open, the flow increased to a little over 40 litres/second. More importantly, with the deactivation valve shut, the swirl coefficient (a measure of in-cylinder swirl) increased from about 0.25 to 2.5 at the same 10mm valve lift. In addition, with the deactivation valve shut, swirl could be seen to have improved over a wide range of valve lifts. But what about away from the flowbench and in a running engine? At a typical cruising road load condition of 1500 rpm and with an air/fuel ratio of 14.7:1, the increased swirl resulted in a much quicker burn rate. In fact, the time taken (expressed in crankshaft degrees) for the first 10 per cent of the combustion process to occur decreased by 12 crankshaft degrees, and for the next 80 per cent of combustion, decreased by 17 crankshaft degrees. Perhaps most significantly, in these load conditions, the ignition timing advance for best torque could be reduced from 35 degrees to 17 degrees! 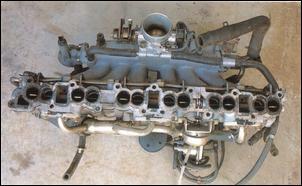 In addition, the knock limit of the engine at light loads was substantially improved with the SPI valves shut. As can be seen, at light cruising loads the combustion behaviour was dramatically altered by the use of the SPI system. In order that the advantages of the SPI system could be further exploited through resonant intake tuning, Ford then experimented with dual runners, one for each passage leading to the intake valve. Intake tuning occurs when long runners are used. The negative pressure pulse generated by the descending piston causes a negative wave to travel along the intake runner, being reflected as a positive (high pressure) wave when it reaches the plenum chamber. If the runner length is sized so that this positive pressure wave arrives back at the intake valve when the valve is open, more air will be breathed by the engine. However, this effect best occurs at only one engine speed. Small diameter, long runners work well at improving torque at low engine speeds, and large diameter, short runners work well at higher engine speeds. This is the reason that some cars run dual-length (ie changeover) intake manifolds. Ford engineers reasoned that if the primary and secondary passages of the split induction system were extended for the full length of the intake runners, the deactivation valve could serve another purpose – to alter the intake system’s resonant tuning. Furthermore, if these runners were of different diameters and lengths, the system could comprise a long, relatively small diameter intake (valve closed) varying to a system using a shorter, larger cross-sectional area intake (valve open). 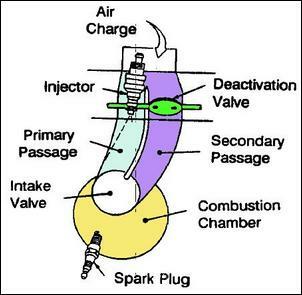 In this way, the behaviour of the airflow entering the combustion chamber (eg swirl) and the resonant tuning of the intake manifold (eg area and length of the intake runners) could be altered by the one system of valves. Testing was carried out on the 2-litre SPI engine. This showed that compared with a single runner system (41mm diameter, 510mm long), a dual runner system (32mm diameter, 585mm long primaries, 460mm long secondaries) gave a 7 per cent increase in torque in the midrange and a 3 per cent improvement at low rpm. (The valve changeover was at 3000 rpm.) No decrease in peak power was observed. However, for packaging reasons, the dual intake runner system was not adopted on production versions of this engine, although the same system was employed on the SPI Essex V6 engines. Unfortunately, isolating the improvements caused by the SPI system on the final versions of the engines is made more difficult by the simultaneous upgrading of other components which also occurred. Some of the changes (eg an increase in compression ratio and the use of larger intake valves) came about as a direct result of the improved combustion behaviour caused by the SPI system but others (eg an increase in swept capacity from 1.9 to 2 litres in the case of the four cylinder) were part of a general upgrade. However, on the four cylinder engine, specific power (ie kW/litre, which excludes the effects gained by increasing the engine size from 1.9 to 2 litres) improved by 16 per cent and peak torque by 8 per cent. On the V6, specific power rose by 33 per cent and specific torque by 7 per cent. In addition, a substantial improvement in idle stability was achieved on the V6. 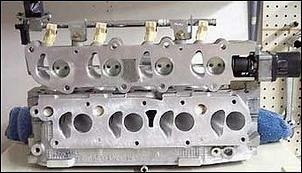 The use of variable intake manifolds – including deactivation of one of the two intake valves on four-valve engines – is now widely used on engines. 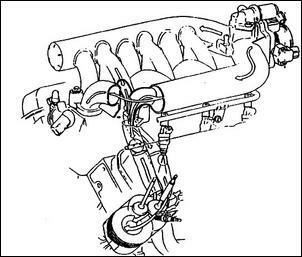 However, it’s been a technique that has not been seen as relevant to older 2-valve designs. But by using a split intake manifold, a divided intake port, and manifold deactivation valves it is possible to alter combustion behaviour and resonant tuning. It’s certainly not something that you’re going to be able to whip up overnight in your garage, but in special build applications – especially where rules dictate an adherence to an original 2 valve head design – it’s certainly an interesting approach.